I don’t know about you, but I like to listen to background music while I work. It drowns out ambient chatter, helps me focus on the task at hand, and really eliminates any distractions that might cause me to lose focus. Trouble is, when a song I like comes on via iTunes' shuffle mode—or worse, when a song I hate comes on. Suddenly, I'm either singing along or diving for the iTunes fast-forward button—in other words, not focusing on the task at hand. Tesla Audio Sciences figures to have a solution with AmbiScience , a $1 app that recently joined the ranks of other ambient music offerings at the App Store. 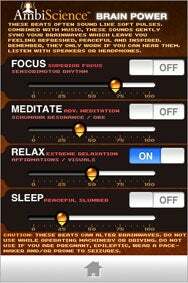 The difference with AmbiScience, according to Tesla Audio Sciences, is the app’s BrainWave Entrainment feature, which promises to “sync your mind” and thereby enabling you to focus, relax, sleep, or meditate without distractions. The app boasts 9 CD-quality tracks. As you might imagine, it’s a little larger than your typical App Store downloads, weighing in at 136MB. The developer promises future updates will deliver enhanced volume controls and a timer fade. In the meantime, AmbiScience runs on any iPhone or iPod touch with the iPhone 2.2 software installed. And if you’d like to try things out for free, there’s a free lite version of AmbiScience, as well. Mathomatic , from Gotow.net: The $2 symbolic math app solves algebraic problems, whether they’re middle-school homework problems or complex polynomial and multivariate systems. Poker DealMaker ICM , from TimeToDream: The $2 poker app uses the Independent Chip Model algorithim to calculate what the equity of each player’s chips are worth at the final table of a poker tournament. RunChart , from Marstec: The $3 app logs the run times of your favorite jogging routes. HemeCalc , from QxMD Medical Software: The free iPhone version of the hematology app includes calculates to determine probabilities for deep vein thrombosis and pulmonary embolism as well as bone marrow involvement in Hodgkin’s Disease, febrile neutropenia MASCC risk score, and Epo/GCSF response in myelodysplastic syndrome, among other hematologic conditions. PinPoint Me , from Jtribe Holdings: The $3 navigation app lets you pinpoint your location on a map and e-mail that location to others. Mister Lister , from JMHammond: The $2 shopping app lets you create lists based on previous purchases. Got an app you’ve just released to the App Store? Drop us a line. Updated at 8:46 p.m. PT to fix a misspelling of the word “entrainment” in describing the features of AmbiScience.